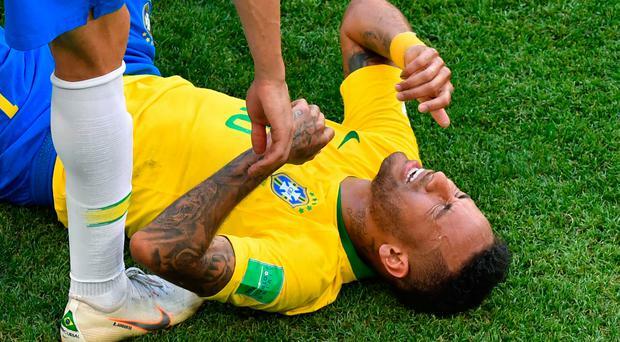 Brazil's forward Neymar reacts as he receives treatment during his side's win over Mexico. Neymar scored one and assisted the other as Brazil beat Mexico to reach the World Cup quarter-finals but it was another side of his game that dominated the post-match analysis. The 26-year-old attacker appeared to be stood on by Mexican defender Miguel Layún and his reaction - rolling in apparent pain - has been slammed by the likes of Gary Lineker and Alan Shearer on Twitter as well as by Republic of Ireland boss Martin O'Neill. "It's absolutely pathetic honestly," O'Neill said on ITV. "The pain threshold of Neymar is incredibly low. I wouldn't want to see him coming out of the doctor's surgery getting a flu injection." O'Neill even said that Neymar's 'play acting' is taking away from his otherwise impressive performances at a World Cup tournament in which he has now scored twice. "He's a top quality player but part of our thinking is to do with this play acting. He gets up and he's completed four games. He doesn't do too badly out of it," O'Neill said.